This week, we introduce you to our very own Amberlie Cameron-Smith! 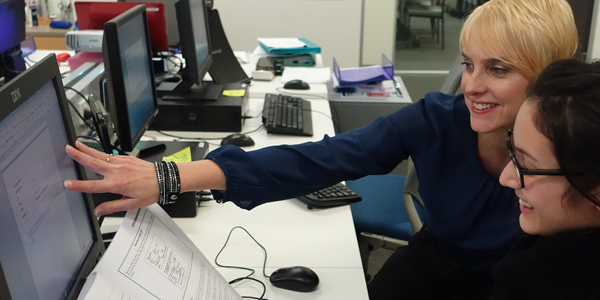 Amberlie’s one of our business college’s most versatile trainers, delivering both the Certificate II in Business as well as the Certificate III in Business Administration, among several other things. She has been with Suzan Johnston Australia for many years now, and we salute her as our “Jill of All Trades”! We’re fascinated! Can you tell us about your multifaceted background? Prior to Suzan Johnston, I was modelling, and I’ve also worked in both the hospitality and retail industries. When I first started at SJ, I began with teaching the finishing courses as well as the modelling courses. Then I had an 8-year hiatus away from SJ and was involved in the health and fitness industry, beginning as a receptionist and progressively working my way up to a Regional Operations Manager role. Wow – from modelling to health and fitness to business training! (Laughs) Yes, well, it was just a natural progression. With my background in customer service training and experience in receptionist training, I was excited when a trainer role opened up for the receptionist course. I have been delivering the administration courses for 4 years now, I think – starting with the receptionist course and then the PA course when the opportunity arose. As an office administration course trainer, what do you think are the benefits of students undertaking formal training for receptionist roles? Let’s be honest here – does one really need personal assistant training? One of the major components of our secretarial course is telephone etiquette. This includes learning how to properly answer and transfer the call, as well as understanding the importance of engaging with the caller even when we aren’t face to face. It’s all part of customer service training! As for computer skills, I always tell my students that they are much better off than I was when I first started working in an office environment. I didn’t have any formal administration training. I would look at spreadsheets and PowerPoint presentations and think you needed a degree to create and adjust them! I would spend so much longer than necessary working things out. Our students who complete the Certificate II in Business and Certificate III in Business Administration will go in armed and ready with these skills! Let me put it this way – our graduates will be more confident and perhaps be promoted faster than I ever was. If I had my time again, I would absolutely have done an administration course. Having said that, we all have our paths, and I’m rapt to be where I am today. Hindsight is a wonderful thing…. Right! We hear you. Back to the now – do you have a favourite unit to teach? I can’t pick one! Can I do two? If so, they’d be ‘Write Simple Documents’ and ‘Design and Produce Text Documents’. 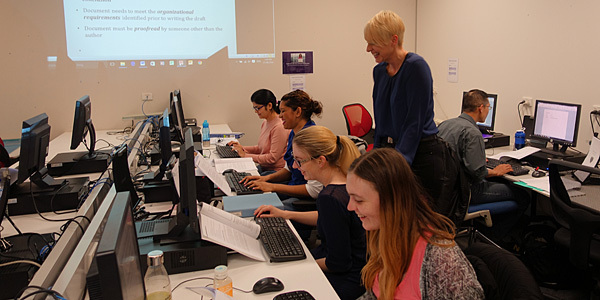 These units are packaged within the national recognised training and are designed to teach students how to create document templates and compose professional correspondence. This is extremely practical for their business training. Okay, I am going to get a bit greedy here with a third favourite! PowerPoint should come in here too as it is actually quite simple yet so very effective. And you don’t need a degree to use it, as I later found out! I am so pleased it is a part of our personal assistant course, as a lot of PAs do get asked to put together presentations for work. 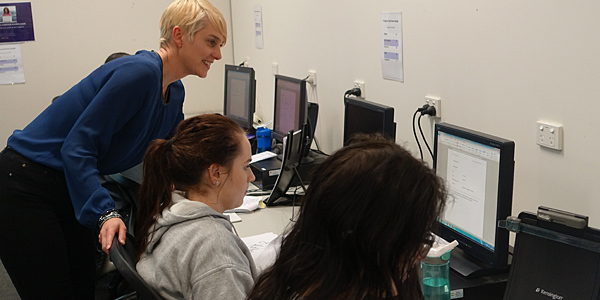 What do you think students enjoy the most from both the receptionist course and the personal assistant course? From the feedback and chatter I receive and hear, I know students love the friendships and supportive environment here. They gain support and encouragement not only from their fellow classmates, but also from other staff members here at Suzan Johnston Australia. Our business training graduates always receive really fantastic feedback, and I feel that a lot of it has to do with their confidence. During their receptionist training and personal assistance training, we scaffold their learning with a good, strong foundation of skills and knowledge. This really helps with their confidence when working in an office environment. What’s your biggest sense of pride as a business administration course trainer? Easy! When our students are successfully placed in jobs, or when they realise they can do the work and you see their confidence bloom. I love it! Okay, we’ve touched on the past and the present. Now on to the future – what do you foresee as industry changes that students will need to keep up with? This isn’t anything new, but certainly keeping up-to-date and in touch with new technology. Also, the ability to multitask and adapt to change as their role diversifies. For example, a receptionist does not ‘just answer phones’, they are often also scheduling diaries, managing stock and accounts, plus so much more. Thanks, Amberlie! We might have to rope you in for another interview about the other hats you wear here at Suzan Johnston! Hey, like you said, I’m the “Jill of All Trades” – bring it on! Do You Want More Information on Our Certificate II in Business or Certificate III in Business Administration Course? For more information on our nationally recognised courses in business training, or to learn more about our customer service course, please visit our website at www.sjaustralia.com.au or call us on (03) 9654 0999 to speak with one of our friendly consultants.